Redruth captain Chris Fuca has said his side were "gutsy" to come back from 25-10 down to beat Lydney 27-25 in National Two South. Second-half tries from Tommy Phillips and Sam Parsons, as well as a penalty try, moved the Reds back above Cornish rivals Launceston into 10th place ahead of Saturday's derby. "It was a gutsy performance in the second half," Fuca told BBC Cornwall. "It showed huge character to come out in the second half and nil them." 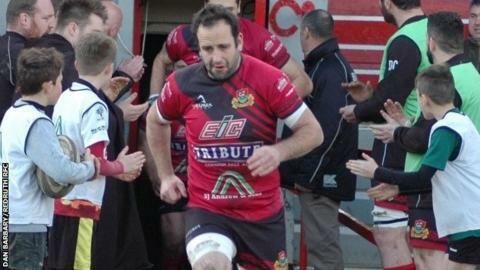 The win ended a three-game losing streak for Redruth, who have won just twice since the beginning of November. "We've got a lot to work on and five points is five points and we're going in the right direction in the table," Fuca added. "If we'd have lost that one we'd have been in the mire a bit and we didn't need that, so it was a big bonus for us." And Fuca said his side can now focus on travelling to Polson Bridge for the derby in a positive frame of mind. "It's a big game, we know that, we just have to go up and play better than we did today. "I'm sure we'll get a result if we just stick to our game and be really positive in our attitude and not worry too much about them."